Smyrna (Turk. 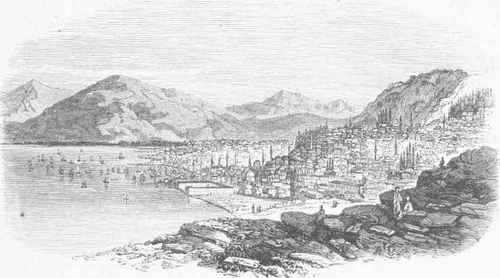 Ismir), a town of Asiatic Turkey, capital of the vilayet of Aidin, near the head of the gulf of Smyrna, on the W. coast of Asia Minor, 210 m. S. W. of Constantinople; pop. (according to the Austrian consul general Scherzer's estimate in 1873) about 155,000, including 75,000 Greeks, 45,000 Turks, 15,000 Jews, 10,000 Roman Catholics, 6,000 Armenians, and 4,000 Europeans and Americans. Another estimate places the population at 180,000. Owing to the large preponderance of the Christians, it is called by the Turks the Giaour city. It stands upon a plain between the ancient Mt. Pagus and the sea, part of it on the slope of the hill. The streets are generally narrow and dirty. An interesting locality is the so-called caravan bridge, with adjoining grounds for the accommodation of camels during the night. Along the shore and in its vicinity reside the Christians, excepting the Armenians, whose quarter is partly on the lower slopes of the hill, the upper slopes being occupied by the Turks; and in the region between the Armenians and Turks live the Jews, who are chiefly of Spanish descent and mostly poor. On the summit of the hill is a castle. A quay is in course of construction. Smyrna contains a governor's palace, churches for various denominations, a convent, and several schools, that of the Prussian deaconesses being the best. A large Roman Catholic cathedral is in course of construction. An archaeological school was projected in 1874 for promoting excavations at the site of ancient Ephesus, adjoining a station on the Smyrna and Aidin railway. Another line to Ala-Shehr (the ancient Philadelphia) was extended from Kas-saba in 1875. A Turkish governor general, and Greek, Armenian, and Roman Catholic archbishops reside in the city; and there are American and other missionaries. In the adjoining villages of Burnabad and Budja are fine villas. Smyrna is an important station for steamers and a great commercial emporium; the harbor is magnificent, and at all times crowded with shipping. The entrances in 1873 were 630 steamers and 785 sailing vessels, tonnage 659,247; clearances, 627 and 693, tonnage 648,579. The imports, chiefly cotton and other manufactured goods, amounted to $23,332,780, and the exports, including cotton, figs, raisins, opium, sponges, and valo-nia, to $20,794,332. The shipments of cotton, now so important, were insignificant previous te the American civil war. In 1873-'4 the imports from the United States, chiefly petroleum, were valued at $300,000, and the exports to the United States, including opium, figs, liquorice root, wool, and rags, at $2,234,344. - Smyrna was probably colonized by .Aeolians from Cyme, but early fell' into the hands of the Colopho-nians, and in the 7th century B. C. formed the 13th city of the Ionian league. According to Strabo, it was destroyed by Sadyattes of Lydia about 627, and remained in ruins for several centuries. It was rebuilt and enlarged by Antigonus and Lysimachus, successors of Alexander the Great, and became one of the first cities of that era. One of the seven churches mentioned in the book of Revelation was at Smyrna, and Polycarp was its first bishop. The town was destroyed by an earthquake in A. D. 178, and rebuilt by Marcus Aurelius. It afterward had many changes of fortune; and being occupied by a Seljuk chieftain about the end of the 11th century, it was nearly destroyed by the Byzantine fleet. It was again rebuilt, and subsequently the Genoese held it for a long period. In the latter part of the 14th century it was taken by the Turks, in whose possession it ultimately remained, after being captured in 1402 by Tamerlane. Among its many calamities in modern times were the conflagration of 1841 and the earthquake of 1846. In July, 1853, Martin Koszta was delivered here from the hands of the Austrians by Capt. Ingraham. - See Scherzer's La province de Smyrne (1875).